Will Trump Revoke CNN’s Credentials? RUSH: This Jeff in Louisville. Great to have you on the program. How are you doing, sir? CALLER: Hey, Rush thanks for having me on board. CALLER: So I’m a registered Independent and I’m looking at the news these last few weeks. And so my question to you is, as the insider, at what point, what is the tipping point where Fake Media no longer becomes media? To the point that, okay, if you want to become a media organization, that’s great, but your seat is next to the National Enquirer or the Sun-Times, because you just can’t get it right, either side of the case. What’s your take on that? RUSH: I’m not sure what you’re asking me. CALLER: Yeah, so Jim Acosta, well, he’s a sider so that’s fake media. Well, this whole kid who put out — not a kid — who put out this thing on Trump beating up CNN, you know, this whole blowup, they’ve lost their minds. At what point does the administration go, “Okay, we’re kind of done.” It’s like my five-year-old throws a fit, I try be a good dad, “Okay, okay, okay, okay, look, go to your room, be quiet. When you’re ready to act like an adult, you can come back to the table, but in the meantime, go to the corner.” Is there a point we get there, or not? RUSH: Well, okay. I think what I’m being asked here is why does Trump continue to even deal with them as media since they’re Fake Media, since he’s claiming they’re fake, why do they even get into the pressroom. You will be happy to know that there have been — it’s ongoing, no decisions — discussions about eliminating CNN’s credentials in the Trump press office. They have talked about this for some of the very reasons that you assign. My question is more basic. You know, we’re all operating under tradition in many things, and tradition is that the president is the president and the media is the media, and the media gets to ask representatives of the president questions each and every day at the White House press briefing. And we have accepted as tradition if it’s a Republican president the press can lie and distort and trick and deceive and be mean all day long, and we just have to deal with it ’cause that’s how it is. If it’s a Democrat president that happens to be the first African-American, then we just have to deal with the fact that the press is a bunch of sycophants and they’re gonna spend all day long kissing the president’s rear end. And they’re gonna do everything they can to cover for him. Okay, fine. Why do we have to accept this tradition? Why does our side have to accept their tradition that the media gets its fair chance at destroying us every day? Why is that considered a part of behavior in the establishment? Why? Why do we, why does our president, why does Bush, Reagan, you name it, Trump, some of us, why do we have to just sit here and take it and say, “Well, that’s just us. That’s the polite way. That’s the way the jib is cut.” Why? Well, obviously Trump doesn’t believe that. Trump doesn’t accept that tradition, by a long shot. And this is what it looks like when you blow it up. They’ve always told us, “It would be silly!” You’ve heard the old adage: Don’t ever get into argument with people who buy ink by the barrel. And, by the same token, we are to sit idly by while the media — while we call them, while we acknowledge that they’re the news. They treat the Democrats and leftists with the softest of gloves and with love and devotion, and they cover up for them, and they’re never hard on them. They’re never critical of them, or seldom. These are just the rules, and we have to sit there and we have to put up. By virtue of the fact that we are going to be conservative, call ourselves conservatives, certain things we have to accept. We have to accept the media is gonna try to destroy us, dehumanize us, delegitimize us, rip us, destroy our president and our elected officials. We just have to sit there. And by the same token, when they do the opposite with Democrats, we have to accept that. Why? I understand his question. If they’re fake news and if they’re fraudulent news, what are they doing in there? What are they doing that guarantees them a seat, guarantees them a credential? Why are they there? Tradition? Well, they’ve always been there. They’re part of the media. They have White House correspondents. You know what I mean, Mr. New Castrati. It’s not real. It’s orchestrated. It’s choreographed. They’re salaried. They’re paid for. They may be independent contractors, but they’re paid to show up and raise hell, creating a news narrative. Let me show you how ridiculous this gets. Grab sound bite, what is it, number 23. Trump and Merkel shook hands. CNN had to analyze it. This afternoon on Wolf Blitzer’s show, John Brennan filling in for Wolf. I don’t know where Wolf is. He spoke with senior Washington correspondent Jeff Zeleny, who used to be at the New York Times. Zeleny is traveling with the president. In fact, Zeleny is on rooftops even now reporting on the protests. (interruption) Oh, you don’t expect the reporters to actually get down in there amongst them? Hell, no, folks. They’re not gonna dirty their suits for the cocktail party and dinner tonight. Hell, no. They’re gonna have seats up there on the rooftops where they can watch the protests and tell us that all of this represents hatred for Trump and therefore hatred for America. And then they head off to the cocktail party or dinner or wherever they’re going, always with the camera in tow, in case of breaking news. Now, stop and think of that question. “Do you get the sense the White House was preparing for this?” No. No, I think Trump got off the plane today and I think he was shocked to run into Angela Merkel at the G20 meeting. I think it’s the last thing he expected. And then she wanted to shake his hand, I don’t think Trump knew what to do. What the hell kind of question is this? “Do you think the White House was preparing for this?” Well, here is the analysis of what happened. ZELENY: Sure, I think the White House absolutely cares about the optics of this. We’ve seen several sort of handshakes go awry. I am told that she initiated the handshake by a pool reporter in the room, that she initiated this handshake here. So yes, optics always matter in this case. I think we probably make more of them now in the age of social media than we used to. You know, there always were awkward moments here, but it’s the substance of this meeting, they have so many disagreements that really will be an issue here for these two countries going forward. BERMAN: You know, Jeff, we just saw the video again. We all can confirm that yes, she did seem to initiate the handshake. Her hand went out first. RUSH: There you have it. 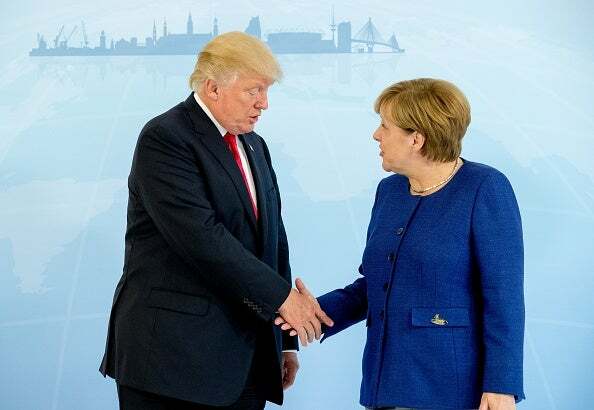 Breaking news at CNN that Angela Merkel was the first to offer her hand in shaking Trump’s hand. And I will guarantee you this disappoints them. The only reason this is news to CNN is that they were hoping Angela Merkel would turn her back to him or maybe even spit on him, all because of pulling out of the Paris climate accords. They wanted Merkel to punch him in the gut, maybe. They wanted Merkel to call him a pig. They wanted Merkel to insult him or do something, they couldn’t wait. But she offered her hand first. Oh, no! Another embarrassment for CNN and another triumph for Trump. A world leader so far out of his league brought herself down to his level and offered to shake his hand. And we at CNN are distressed. RUSH: Here’s Mike in St. Louis. It’s great to have you, sir. I’m glad you waited. CALLER: Hi, Rush. You know, there is speculation that CNN may soon be for sale as part of the process of AT&T acquiring Time Warner, CNN’s parent company? CALLER: I think you should put together a group and buy CNN. CALLER: Its market value’s around $10 billion. CALLER: What do you think? RUSH: First, let’s deal with the factual side. You may be more accurate than you know, although it sounds like you know. CNN is part of Time Warner. AT&T wants to merge and buy Time Warner. AT&T, it is said… There’s a story out today that the Trump administration may actually… This is probably fake news. But the Trump administration may leverage the merger by telling AT&T, “Fine. The only thing you can’t do is buy CNN.” Time Warner might have to spin it off before any merger, thereby putting CNN (which is part of Time Warner) in play. There’s no way in hell CNN is worth $10 billion right now. I don’t care what kind of multiple you use. It could well be down the road. But I don’t know. Ten billion? Buying something $10 billion, that may be not enough money to further my image. CALLER: Football teams only cost a billion. RUSH: (chuckling) Well, that’s true, but you’re actually getting value there. CALLER: (laughs) Well, just the same, I think you should investigate. RUSH: I appreciate that. I really do. That would be so much fun. Can you imagine the staff meeting after the new ownership walks in, and the CNN reporters that were there?